OTTAWA, October 21, 2014 – Tom Eagles, Dominion President of The Royal Canadian Legion, presented His Excellency the Right Honourable David Johnston, Governor General and Commander-in-Chief of Canada, and Patron of The Royal Canadian Legion, with the symbolic First Poppy today at Rideau Hall setting the stage for the Poppy Campaign to get under way officially almost two weeks later on Friday, October 31st. The Legion’s Poppy Campaign always kicks off the last Friday of October when the Poppy blossoms on the lapels and collars of more than 18 million Canadians. “The Poppy reminds us of past sacrifices and the continuing needs of our disabled Veterans, RCMP members, widows, widowers, orphans and family members of those who served,” says Mr. Eagles. 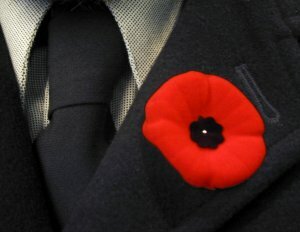 “By wearing the Poppy, His Excellency will help us remember Canada’s Veterans’ both past and present who, at the call of their country, left all that was dear to them, faced danger and, much too often, passed out of sight of all Canadians through their self-sacrifice giving up their lives so that others may live in freedom,” adds Mr. Eagles. For further information please contact Bruce Poulin at Dominion Command, The Royal Canadian Legion at bruce.poulin@legion.ca or (613) 591-3335 ext. 241 or by cell at (613) 292-8760.